Amy, I mix cottolin an 2/8 cotton in the warp and weft all the time and they work well together. No problems shrinkage wise. I don’t recall personally ever mixing the 2 in a warp Amy, so I can’t give you a definitive answer. 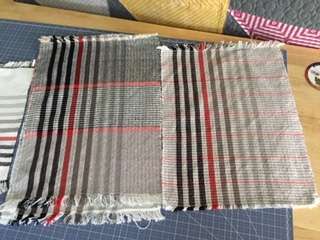 However, this is a sample warp Jane created so that we could practice using different techniques. Now would be a great time to try it and see what happens. 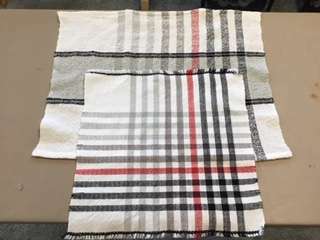 Weave a sample, measure before and after washing and if the cottolin reacts differently. If you don’t like it, then this would be the time to swap out the black cottolin and practice changing that stripe into a colour of 8/2 you do have on hand. Jane shows us how to do that in the Introduction to Sample One at about the 30 minute mark. Have fun! 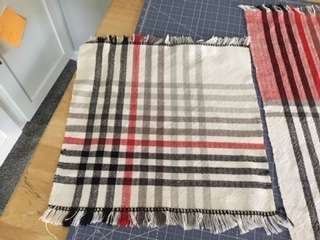 I am getting ready to warp this asymmetry sample and have a question about fibers. My local shop was out of 8/2 black cotton but I do have a cone of black cottolin. Can I use the cottolin for that one area only? What will happen when it is washed? Do they shrink the same? I didn’t know if the cottolin would need to be evenly dispersed throughout to mix the two. They are wonderful Ellen! You sure did alot of different samples. It is nice to just put a warp on and play with it! This was a really freeing experience. I put the warp on the loom with no expectations of perfection and allowed myself to try lots of different things. 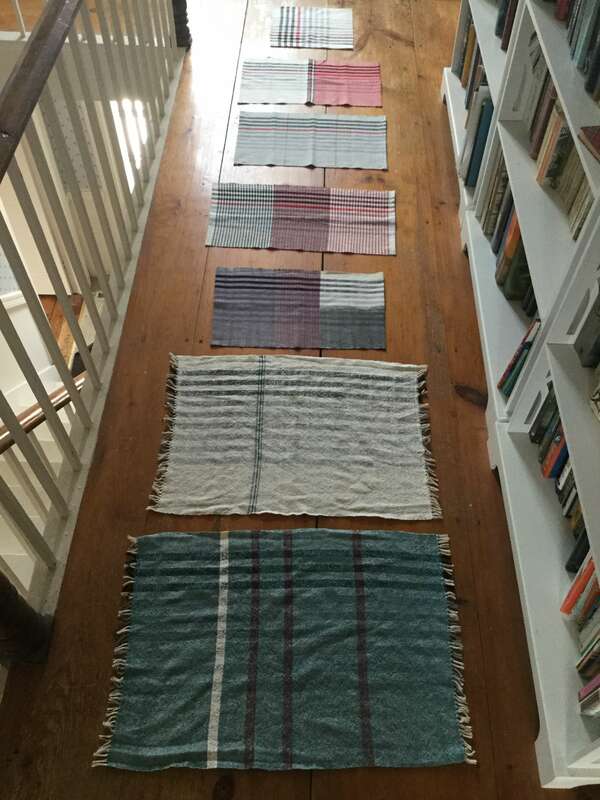 I learned a lot about design, carrying threads up the selvage, sett, clasped weft, and color. 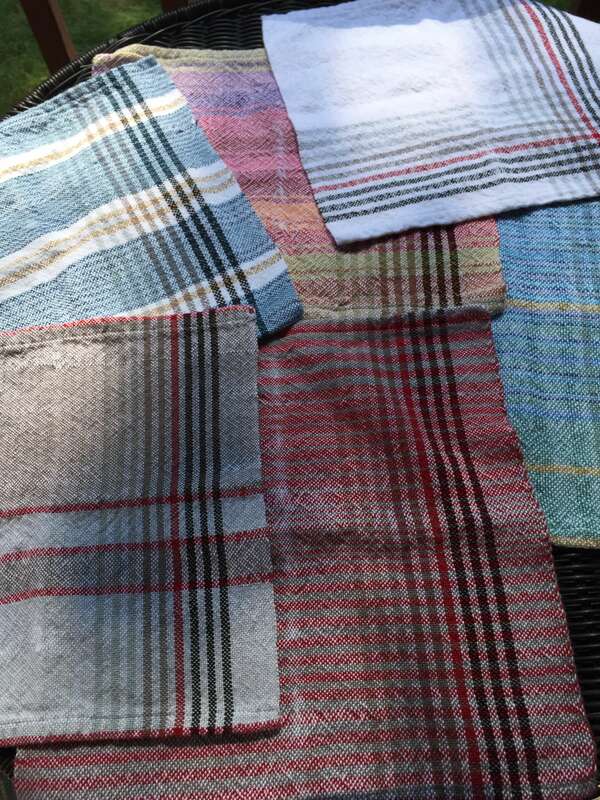 Here are my finished towels. 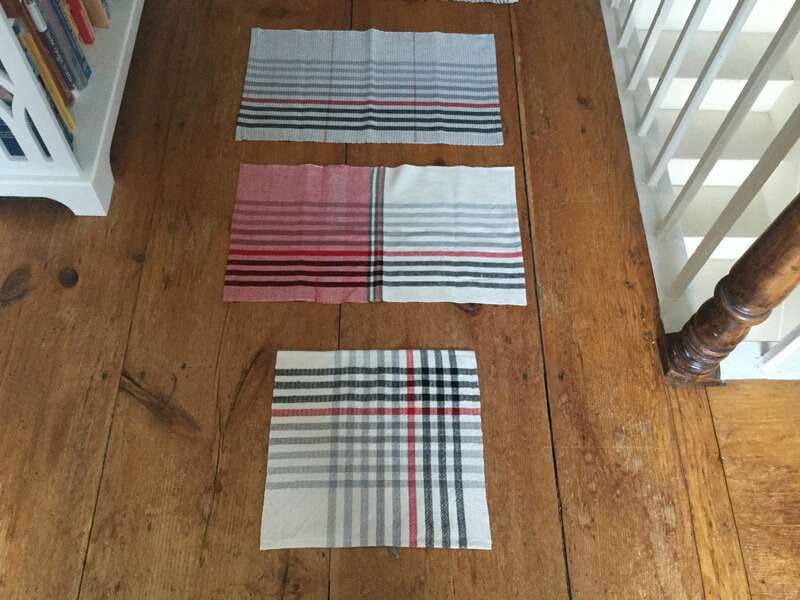 How exciting to have a new Jane loom and your samples look great! I am also a huge fan of the boucle and my stash always has a cone or two! I wove my first sample set on my brand new Louet Jane 27″ loom. OMGosh! learned loads of fun things. I was really getting bored with the length of the warp but I’m so glad I finished it. the only thing I didn’t try was cutting out the red and adding black. Maybe another project I’ll give it a try. I did open the loom up from 18EPI to 12EPI and used Boucle yarn for the weft, again OMGosh I love the Boucle … it may have to be a staple in the yarn pantry for sure. 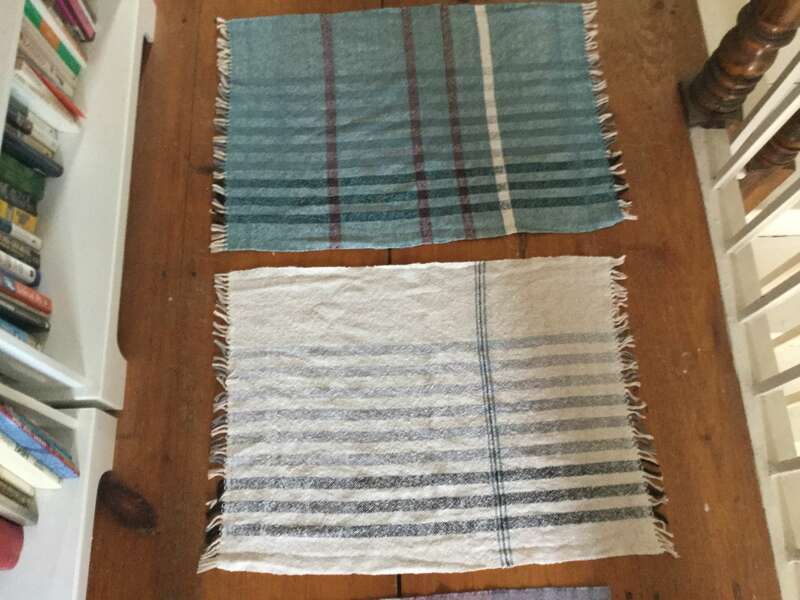 I wove a towels and a napkin 18 epi and they turned out nicely – washed and ironed in hems to but haven’t stitched yet. Opened the sett up to 12 epi and came here for ideas and inspiration. I have no boucle, so have been deciding whether to use 8/2, 8/4, or 3/2. I’m seeing here that people have used 8/2, 8/4, and wool! So tomorrow I’m ready to see what happens with 12 epi with other sizes until I run out of warp. My selvedges aren’t great but I was concentrating on squares and ppi. Also I have done better with starting new colors. These are, however, high contrast, so it’s great practice getting all the pieces and parts together! 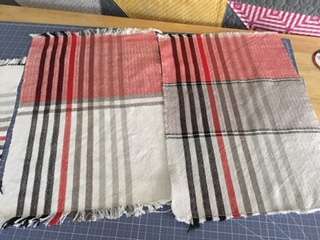 Hi, it was a cotton warp and the sett was 6 threads per cm. The weft was a blend of wool with tencel I think. Jacqueline, on March 10th you posted a pic of 2 shawls you did in Merino weft and Tencel warp (i assume). What SETT did you use? 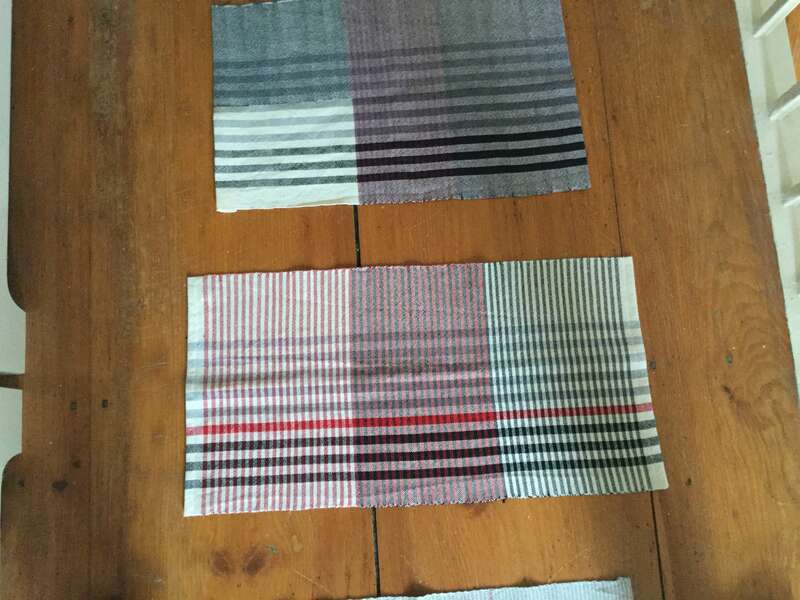 Then I sampled at 16 EPI plain weave – it’s OK but a bit too much weft faced for my taste. Fairly soft and drapey after washing. Still not ideal. I could do a third sample at 18 EPI but i thought i’d asked you first and save the Zephir for the shawl – the tube goes down quickly! This was my first double width project. See the white strips down what was the fold in my cloth? HELP! What did I do wrong? I want to avoid this in the future. It really didn’t seem like I had excessive draw in on that side. I used a 4 shaft table loom and 8/2 cotton. In person it appears to be warp threads are very close together not weft. Also it’s more apparent in the 18 epi sample, the 16 epi less so. I really didn’t experience any problems with the tension, I was surprised as I thought I might. I will not forget that step in the future though. 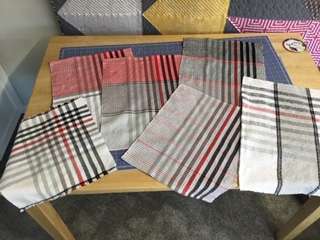 I also learned more about my weaving software and how to do double with cloth so I might be able to do the next lesson as double width and not resort to the rigid heddle. Think I’ll give it a try anyway. While I faced many obstacles with my first lesson, I learned so much! A Big Thanks to Jane and the whole gang! I love the colors you chose. You’ve inspired me. Thanks. They look great Carol, the colours are sure making them so different! How did it work out at the back of the loom with the lashing? We’re you able to lash it when you reached it?